Welcome to the realm of “Mickey Mouse” apartments, where the largest studio unit is only 420sqft and penthouses are less than 1200sqft. Welcome to EASTWOOD REGENCY. After a couple of “misses” over the past couple of weeks (including one Sunday afternoon when we overslept through our nap and ended up at Trilight instead), the wife and I finally managed to get to EASTWOOD REGENCY yesterday. EASTWORD REGENCY is a 75-units low-rise condo project consisting of 2 Blocks of 5-storey each. This freehold project sits on an odd-shaped plot of about 28,000sqft, and currently is expected to TOP by 31st December 2013. It is developed by The Fragrance Group – a boutique developer who is also responsible for smaller projects like The Cotz, Prestige Loft and Parc Imperial etc. The actual site/sales gallery is located on Eastwood Road – you travel till the end of Upper East Coast Road that joins onto Bedok Road - Eastwood Road is just round the bend and across from Bedok Food Centre. For those of you who know where Laguna 88 condo is, EASTWOOD REGENCY is located right next door to it. Given the “small project” status, the facilities in EASTWOOD REGENCY are understandably basic – you get a lap pool, children’s pool, gym, BBQ area and Children’s playground/Fittness corner. There will be a grand total of 75 carpark lots – 55 of these will be in the basement while the remaining 20 are surface level/“open air” carparks. It will be interesting to see how the Management go about allocating between the basement and surface carpark lots, if there are more than 55 car owners within the condo. Normally the wife and I will get to the pricing last. But we felt compelled to tell you in advance (so you may decide if you wish to read on) that the average price for the studio and 1-Bedroom apartments in EASTWOOD REGENCY is $1200psf, while the penthouses are going at a lower average of $1075psf. And if you need to do a double-take on the price, you are not alone. $1200psf for an apartment in Bedok you say? Well, at least 20 people seemed to think that the condo is worth its asking price, if the number of units sold so far is any indication. 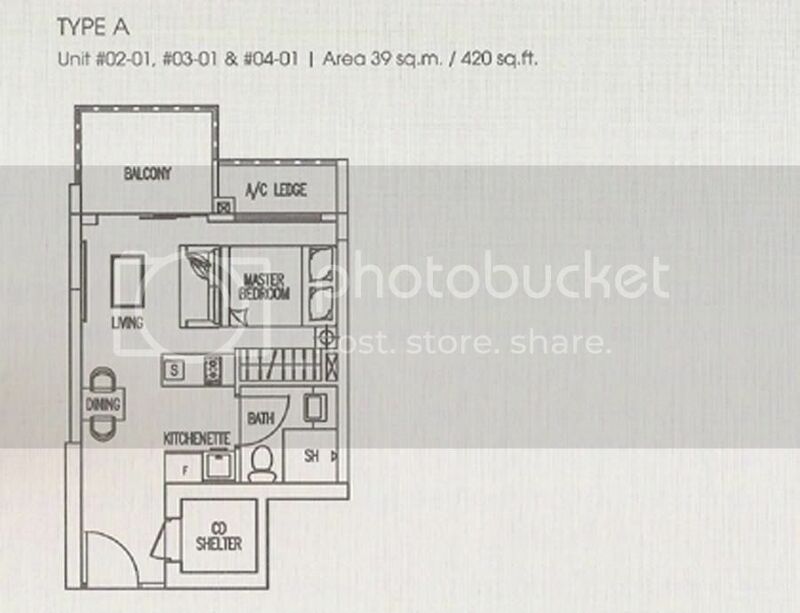 The showflat on display is the 420sqft Studio (Type A). Once you enter the main door, all you can see is a living area that is almost fully occupied by the “Queen” bed, the tiny kitchen (the developer calls it the kitchenette) and the bathroom. Other than these, there is probably just about enough room to fit a small square dining table for two into the apartment (as per what they did in the showflat). One wonders why the developer still include a balcony in such small units, as this, together with the small squarish bomb shelter, will eat further into the already small space of the apartment. In terms of furnishing, the unit comes with 60cm x 30cm marble-slab flooring that covers almost the whole apartment except for the balcony, bomb shelter and bathroom. The kitchenette is equipped with “Electrolux” induction hotplates and oven, as well as a built-in single-door fridge. The bathroom has ceramic tiles floor/walls and comes with a standing shower cubicle (not the rain shower type, sorry!) as well as “Grohe” bathroom fittings. The small wardrobe besides the bed is functional but nothing to shout about aesthetically. For an apartment with a $1200psf price tag, the quality of furnishing is really quite disappointing. • For a small project from a “boutique” developer, the quality of their marketing brochure is certainly quite impressive. And it comes in the perfect size too, for my A-4 size scanner that is. Other than that, the wife and I are really at a loss for words on what else we like about EASTWOOD REGENCY. Okay, maybe the fact that the project is within minutes walk to the famous cuttlefish/kangkong stall in Bedok Food Centre? • One of the main selling points of EASTWOOD REGENCY is the supposed greenery view of the adjacent Laguna Golf & Country Club. But in reality, you are either overlooking the landed homes along Eastwood Road or the tennis courts of Laguna 88, depending on whether your unit is facing the front or back. So for those of you who expect to see the same vast amount of greenery from your apartment balcony as per illustrated in the newspaper adverts, you may be in for some disappointment. • 1184sqft 2-bedder split over 2 floors, with balcony/bomb shelter on the lower level and a large private roof terrace on the upper level, and they actually call this a Penthouse? And to add salt to injury, THIS is the largest of the penthouses available in EASTWOOD REGENCY. Maybe it is just us and our idiosyncrasies, but we tend to consider such small units as “apartments on the highest floor” rather than penthouses, as (IOHO*) we normally associate a penthouse with unit that is no less than 2000sqft in size. So the wife and I are still trying very hard to come to terms with the concept of “baby penthouses”. 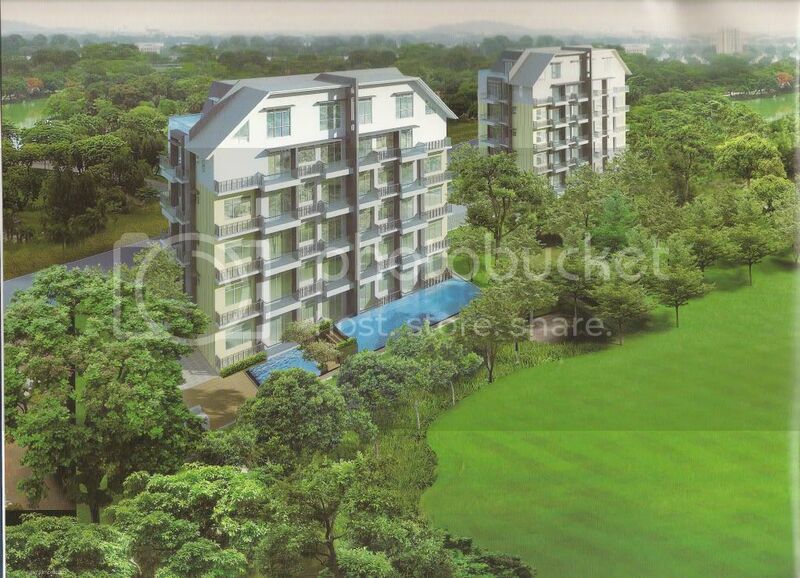 • $1200psf on average for an apartment in EASTWOOD REGENCY? One can harp on the freehold status and “greenery” view of this project, but you can get the same view from much bigger apartment units at Laguna 88 next door. Sure, you can argue that Laguna 88 is 10 years old and leasehold, but we figure it is probably still a better buy given the bigger living space that the apartment units offer and at half the psf price (according to the the latest URA transaction data). • For investors contemplating a unit at EASTWOOD REGENCY for rental income, you may want to double-check on the rental potential of the area. As far as we know, getting decent rental yields for condo units at the Eastwood area can be quite a challenge given the locality and the already severe competition for rentals amongst the existing condo developments. This is especially when you are paying $1200psf, despite the lower overall price quantum of about $500K for Studio and $600K for the one-bedder units. In summary, the wife and I feel that an apology is in order to the guys at Centro Residences (Ang Mo Kio) – we did say before that their price is “Siow” IOHO*, but the price of EASTWOOD REGENCY actually makes Centro looked cheap… price-wise, of course. No Comment to " EASTWOOD REGENCY (Review) "